You can duplicate a discussion in your course. When a discussion is duplicated, the word Copy is added to the end of the assignment name. The person who copied the discussion is shown as the author of the discussion and is immediately subscribed to the discussion, and the date the discussion was copied displays as the last posted date. Copied peer review discussions retain the peer review settings and Assign Review date, but the number of reviews per user will be set to zero. Copied discussions are always assigned to everyone in the course; differentiated discussions are not retained for individual users, groups, or sections. If a differentiated discussion includes an Everyone Else date, the copied discussion retains the Everyone else date, if any. Locate the discussion you want to duplicate and click the Options icon . Click the Duplicate link . View the discussion duplicate in your course. 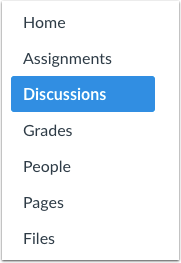 Note: If applicable to your course, the Discussions page displays any Blueprint Course icons after the page is refreshed. Previous Topic:How do I create a group discussion in a course? Next Topic:How do I use Draft State in Discussions? Table of Contents > Discussions > How do I duplicate a discussion in a course?